One of our clients recently became interested in taking their inventory control system to a next level. They were offered a solution to go with an out of shelf ERP system. However, it's a requirement that the client has to change the business operation in order to meet the workflow and implicit technical requirements of the ERP system. Moreover, the solution was lack of integration with existing websites and very popular 3rd party mobile platform like WeChat in China (WeChat had 697 million MAUs at the end of December, 2015). Make data complete and rich; this is the foundation for any future analytics and predictions of manufacture and sales. In short: Full stock movement tracking cross the whole business. Does the module support purchase price so it is possible when doing accounting to get an exact value of the entire stock? Hey, great work on migrating stock to Drupal 8. Had a look at the module (made a first pull request for a composer.json file) and like the way it works and fits in with the Commerce ecosystem I proposed last year. Including all the UI actions and services adds a whole new level, but I think it would be better to separate these out. 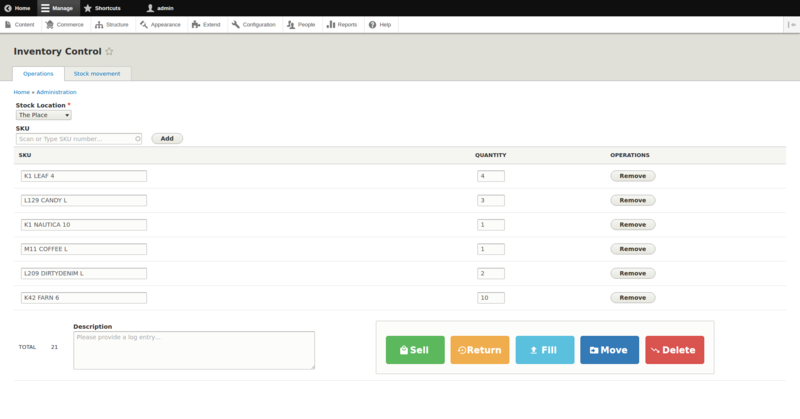 If I already have an ERP system I only need all of the entity types for stock and the checkout type actions. All the management, stock receipts etc are managed in the ERP and synced by a REST API etc. 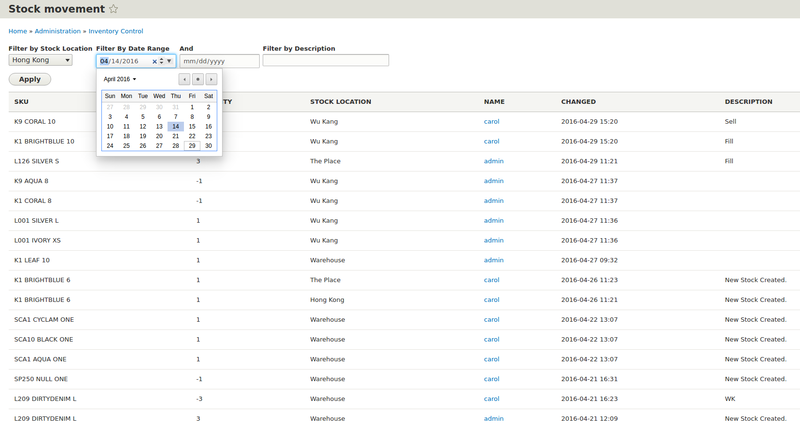 So the base functionality can be in the Commerce Stock module, and then the Commerce ERP module extends that with the UI for managing stock in Drupal. There could then be integration modules like the https://www.drupal.org/project/commerce_unleashed to sync stock data and actions with and external ERP system. Thanks for the feedback. Splitting up the current module is also on my mind. In my opinion, commerce_stock would work just like the simple stock module in D7, which would work out of box with inline_entity_form and only keep track the on-hand stock. The rest of stuff would be Inventory Control Workbench (screenshot above) and Stock Movement. These two might be nice to fit in a submodule. On the other hand, I haven't thought about integration with external ERP, as I haven't used any ERP at all. hi @skyred Nice work however I would strongly recommend your module is renamed to avoid name space conflict with the drupal.org commerce_stock project. @dwkitchen I have put up a post covering what the drupal.org commerce_stock for D8 module does see https://www.blue-bag.com/blog/stock-drupal-8-commerce-technical-overview... and I believe it will address all your needs. Can you please elaborate on the offline screen. It seems you load an online page ... I presume this page is not kept open the entire day and then save periodically when the user is online? How does the offline inventory work? The "add one more" button from Drupal 8 default form only works when the client is connected to the server. Each click will get a response from the server and update its index and security data behind the scene. That's a lot of overhead in our use case, considering the operation stuff will click that button or using barcode scanning gun to trigger that button many times a minute. Also, they don't want to wait one ore two seconds, they want to bulk operate. Therefore, an implementation was added on the client side to match how D8 process form's meta data, therefore, no connection required until form submission.